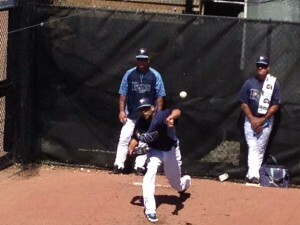 2012 American League Cy Young Award winner David Price, warms up before a spring training baseball game in Port Charlotte. The Tampa Bay Rays have trained Charlotte Sports Park in Port Charlotte since 2009. In the summer, the Rays High A team, the Charlotte Stone Crabs take the field. Port Charlotte is a great town for baseball enthusiasts.